An Australian surfer was killed by huge waves. He swept away from his surfboard in Lombok Indonesia. Victims is a male, come from Queensland, Australia. 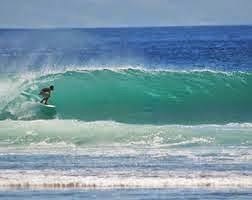 He found floating with his surfboard about 100 meters from the beach ‘Pantai Sorga’, Lombok on Friday, according to local police. Police spokesman said the victim was still alive but in weak condition when rescued from the water and died on the way to the nearest medical center. The victim is identified as a male 54-year-old from Australia, but do not mention the details of the other’s identity. Department of Foreign Affairs and Trade (DFAT) confirmed the man’s death in Lombok and said consular assistance was given to his friends. Large waves are thought to be the cause of the death of a resident Victoria last month.